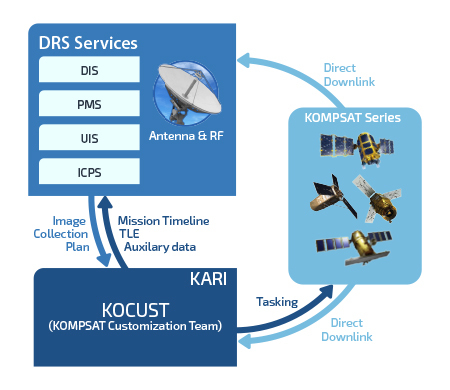 KOMPSAT Satellite DRS (Direct Receiving Station) aims to provide a complete solution to the final customer. DRS is used for the direct receiving system of KOMPSAT at the customer site. It is a flexible and modular system for acquisition, archiving, processing, analysis and distribution of KOMPSAT image data. • DRS is designed for the operational user with a demand for high throughput and cost efficient operations. • The system is well suited as an engine for near real time services. • Direct Receiving Station(DRS) offers cost-effective solution to customers with large need of satellite imagery.